After the death of her beloved late husband, Marnie Minervini (Susan Sarandon) moves from New Jersey to Los Angeles to be near her daughter, Lori (Rose Byrne), a successful screenwriter. Marnie smothers Rose with an overabundance of motherly love, prompting her daughter to enforce some strict personal boundaries. In Rose’s absence, Marnie finds new ways to channel her optimism and forceful generosity. However, can she find new purpose in her own life? Click For Weekly Film Reviews, News & Cinema Events! 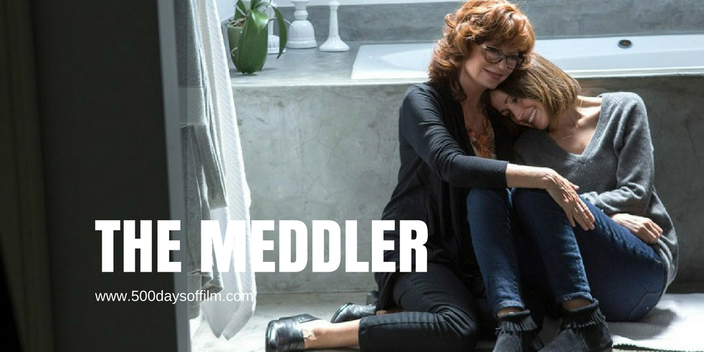 Lorene Scafaria’s The Meddler was released in the UK in June of this year. However, blink and you would have missed it at cinemas. Having now finally watched this film, I cannot understand why it wasn’t given a chance to find a big screen audience. Perhaps it has something to do with the movie’s title - The Meddler. It certainly doesn't sit well with me. Yes, Marine does meddle but that is not what lies at the heart of Scafaria’s film. Far more than just another irritating ‘Mom’ flick, this is a charming story about a mother/daughter relationship and a poignant exploration of the grieving process. Susan Sarandon is wonderful in the central role of Marnie. Her performance is full of comedy and sadness. I was surprised at how moved I became as I watched her journey. Meanwhile, Rose Byrne is also brilliant as Lori. Both actors bring depth to characters that could easily, in lesser hands, have become shallow caricatures. Mid-way through The Meddler, we meet J.K. Simmons’ chicken loving Zipper. His sweet and sensitive portrayal just lights up the screen. If you are in the mood for a sweet, charming and moving comedy, I would recommend that you check out The Meddler. Have you seen The Meddler? If you have, what did you think about this film? Let me know - leave me a comment in the box below!